You can change this soufflé easily by adding your favorite vegetables into step 5. Enjoy experimenting with this dish! 2. Place silken tofu, vegan cream cheese, cornstarch and butter into a blender or food processor. Blend until smooth. 3. Fold in 1 cup cooked spinach. This is the soufflé base. 4. In a sauté pan, heat oil at medium heat. Add leeks and cook, stirring occasionally until light brown, 8-10 minutes. 5. Stir in peppers and zucchini and cook until tender, an additional 8-10 minutes. 6. 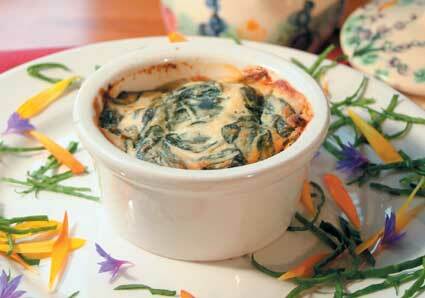 In 5-ounce ramekins, place 2 ounces vegetables then top with 2 ounces (same here) with 2 ounces of your soufflé base. Repeat for each of your ramekins. 7. Bake for 30-40 minutes until brown around the edges.